Welcome to the School of Music's Performance Matters section! You will discover that we have an outstanding faculty, as well as a wonderful program designed to assist students in preparing for their careers as performing musicians and as artists. Incoming students may choose among many ensembles within the School of Music. You are not studying in music but you would like to be part of an ensemble? 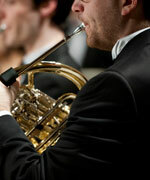 If you are looking for a way to pursue your musical interests but are not studying music full-time, the School of Music invites non-music students to try out for certain ensembles, such as the choral ensembles (for both somewhat-experienced and experienced singers), the orchestra and the Wind Ensemble (for experienced players only). All students may audition for the University of Ottawa Choir, which has both students from the University of Ottawa and members of the Ottawa community. Students may also audition for the smaller Calixa-Lavallée Choir, which tackles more challenging repertoire and is for more experienced singers. Auditions for both ensembles take place in mid-September. For more information or to set-up an audition time, please contact the School of Music.